Picnic baskets are quite often described as the quintessential picnic accompaniment. And it’s not a sentiment that I’m going to sit here and deny. Every good picnic deserves a basket that A/ looks the part and B/ provides a functional piece of equipment that allows you to maximize your picnic experience. Sometimes though, a picnic basket will not prove to be the most practical of items to own. On these occasions, you can almost certainly call upon a picnic backpack to facilitate your needs. There may be occasions for example where you need to cut through large crowds at an outdoor concert or a packed beach. The picnic basket may prove to be cumbersome and difficult to stop from clattering into people. Maybe you need to keep your hands free whilst traveling to your picnic location due to having kids with you. Or maybe you plan to treat yourself to some snacks at the end of a large trek. In both cases, the picnic basket could prove to be inhibitive. You cannot say the same about the picnic backpack, however. No matter the location or situation, strapping on the backpack will allow you to set about your task with minimal fuss. And leave you hands-free to effectively look after the kids / carry other picnic essentials. Using a backpack can also be beneficial because the load of the contents is spread evenly across your shoulders. There is less chance of aches and strains. And you can also say goodbye to constantly having to switch hands when things get too heavy. We have already alluded to a couple of what we think are the best picnic backpacks in a previous article but we would like to dig a little deeper into the genre and hopefully give you a little inspiration for what you deem to be the right picnic set for your needs. We have previously chosen the picnic backpack for 4 by Ferlin as our favorite in this category but we must admit that the offering provided by Apollowalker seems to be every bit as good. It’s an insulated backpack that comes with a waterproof picnic blanket and a wine cooler. It also comes with everything you would come to expect from even the best picnic basket. Things like plates, mugs, salt and pepper shakers, cutting board, cheese knife, bottle opener, and napkins. The quality of goods is inevitably not going to be as refined as the top end picnic baskets. You can say the same of all backpacks. But they are highly functional and with the right care and attention will last you a long time. The blue tartan picnic backpack by VonShef is the best-selling picnic backpack on Amazon and when you look at it you can probably see why. It is often said that you taste your food with your eyes and I think it is this principle that leads to this products success. It absolutely nails what you would like to see visually from a picnic set. The blue tartan is classic picnic coloring. And with the theme running through to the napkins you get the sense that this is a picnic rucksack with a clear identity. It comes with all the same extras as the previous product. Although there are some misgivings over the quality of these extras in customer reviews, they should not perturb you. Yes, the quality is not the highest of standards. But we are hardly looking to use this set to cater for a fine dining experience. And if you really have to, the pieces can easily be swapped out. If you are partial to a nice cool glass of wine on your shindig then I suggest taking a look at the picnic basket for 4 by Mister Alfresco. This picnic backpack comes with some excellent insulation. It shares a vast majority of features as the other backpacks on this page except for one. By attaching the picnic blanket to the bottom of the backpack, Mister Alfresco has ingeniously freed up space on the side for an extra wine cooler. This may not seem a massive deal to you. But for those of us who do love a drop of cool, crisp wine on a lovely picnic shindig it is what we have been crying out for for a long time. Instead of having to jam an extra bottle into the backpack itself or bringing a separate cooler along with you, you and your three fellow shindiggers can now place the extra bottle into the provided cooler. Hallelujah. 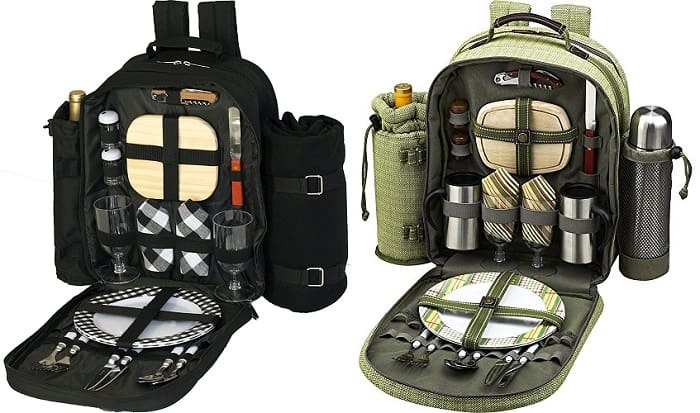 Plush Picnic offer a picnic backpack for 2 with blanket, cooler compartment, and wine holder. It is rather black and featureless on the outside. But it benefits by being handmade with a high-quality water-resistant polycanvas that will not stain, tear or fade. When you look inside the backpack you can forgive the sparsity of color on the outside. The plates and napkin feature a black gingham pattern that certainly gives a feel of class. All the usual extras are present in this bag. With the bonus that a few of them come in a wood finishing. Overall, a non-flashy, solid backpack. 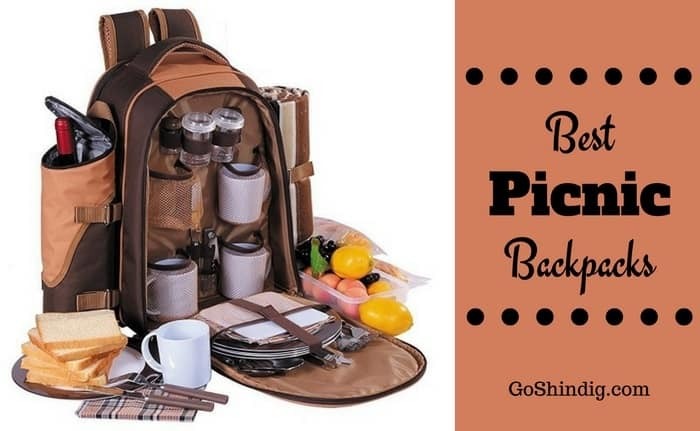 If the quality of extras that you get in your picnic set is a bit of a deal breaker then I would like to point you in the direction of the deluxe equipped 2 person picnic backpack with coffee service by the brilliant Picnic At Ascot. It’s an item that we have recommended before. But if quality is the name of the game then you might forgive us for returning to this little treasure. It features stainless steel flatware, flask, and mugs. It also comes with all the high-quality extras you would come to expect from the best picnic backpack sets. The cooler compartment is fully leak-proof. This means you can easily store ice to make those drinks all the nicer for those hot days.